In one of my many posts on the blog I have mentioned before (and I’m sure I’ll mention again) that I am in awe of mothers. Truly and wholeheartedly in awe. How you manage to clean house, work or just functional normally day to day while having little ones around stumps me. You see, my nephews came for a visit for about 5 days and a few things wound up happening. My house has been trashed. TRASHED. I spent 4 hours cleaning and guess what? My house is still trashed! I got hardly any work done. A lot of this was due to my internet going down for about a week but even if I did have the internet I’m thinking that there would be a considerable amount of stuff that went undone. Things got crazy crafty with the boys constantly asking for “craft time”. Which means that my supplies stash have gotten a bit messed up and the OCD in me is fareeeking out. Feathers in the magnet box? Inconceivable! There is glitter everywhere. They say that glitter is the herpes of craft supplies and whoever THEY are, they’re right. My office floor is crazy glitzy. I actually watched one boy pour an entire jar of red glitter onto a smiley face about an inch wide that he drew out of glue. And I was so surprised, all I did was sit there and watch. My kitchen tile is a nice array of colors as we tie dyed on plastic in there but somehow the dye managed to sneak under and stain the floor. My back is killing me from a sleep-kicker sneaking into my bed at some point every night. Some how I keep stepping on Legos. I don’t know where these things are freaking coming from! I’m wicked awesome at Mario Cart right now. I will beat the pants off of you! One of our crafty projects this past week included Mod Podge easy transfer tee shirts. The process is insanely simple and easily customizable to personalities and favorite things. With a quick image search online, you can make tees that scream I love sharks! or I’m nuts for monkeys! 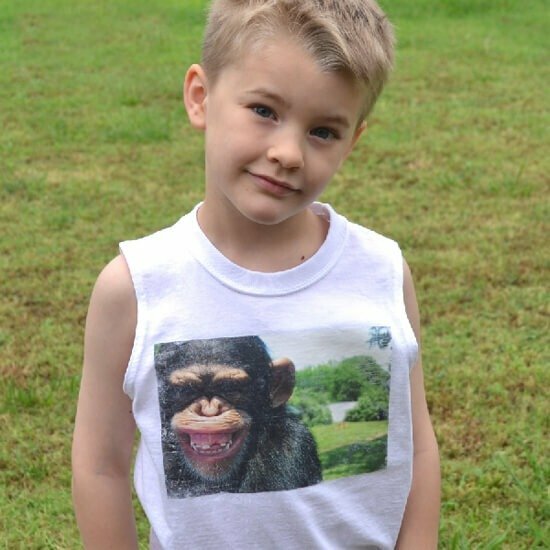 So head on over to Mom Spark to check out the full, and really easy tutorial for Mod Podge Transfer Tees that you can do with the kiddos this summer. It’s lots of fun and the kids will be in awe of the results. The oldest kept saying that his looked like he bought the perfect shirt from the store!